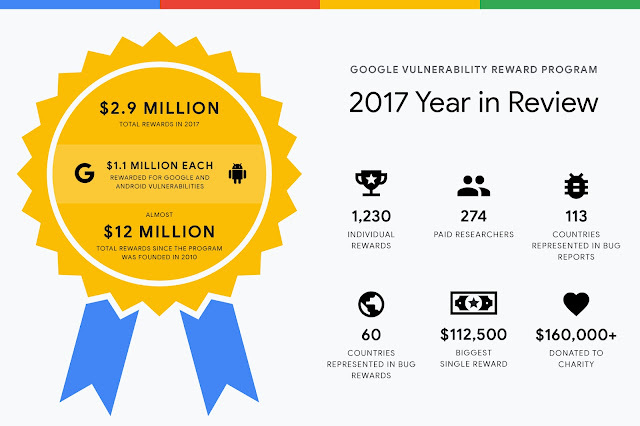 As we kick-off a new year, we wanted to take a moment to look back at the Vulnerability Reward Program in 2017. It joins our past retrospectives for 2014, 2015, and 2016, and shows the course our VRPs have taken. At the heart of this blog post is a big thank you to the security research community. You continue to help make Google’s users and our products more secure. We looking forward to continuing our collaboration with the community in 2018 and beyond! We awarded researchers more than 1 million dollars for vulnerabilities they found and reported in Google products, and a similar amount for Android as well. Combined with our Chrome awards, we awarded nearly 3 million dollars to researchers for their reports last year, overall. Drilling-down a bit further, we awarded $125,000 to more than 50 security researchers from all around the world through our Vulnerability Research Grants Program, and $50,000 to the hard-working folks who improve the security of open-source software as part of our Patch Rewards Program. Every year, a few bug reports stand out: the research may have been especially clever, the vulnerability may have been especially serious, or the report may have been especially fun and quirky! In August, researcher Guang Gong outlined an exploit chain on Pixel phones which combined a remote code execution bug in the sandboxed Chrome render process with a subsequent sandbox escape through Android’s libgralloc. As part of the Android Security Rewards Program he received the largest reward of the year: $112,500. The Pixel was the only device that wasn’t exploited during last year’s annual Mobile pwn2own competition, and Guang’s report helped strengthen its protections even further. Researcher "gzobqq" received the $100,000 pwnium award for a chain of bugs across five components that achieved remote code execution in Chrome OS guest mode. Alex Birsan discovered that anyone could have gained access to internal Google Issue Tracker data. He detailed his research here, and we awarded him $15,600 for his efforts. Over the course of the year, we continued to develop our Android and Play Security Reward programs. No one had claimed the top reward for an Android exploit chain in more than two years, so we announced that the greatest reward for a remote exploit chain--or exploit leading to TrustZone or Verified Boot compromise--would increase from $50,000 to $200,000. We also increased the top-end reward for a remote kernel exploit from $30,000 to $150,000. In October, we introduced the by-invitation-only Google Play Security Reward Program to encourage security research into popular Android apps available on Google Play. Today, we’re expanding the range of rewards for remote code executions from $1,000 to $5,000. We’re also introducing a new category that includes vulnerabilities that could result in the theft of users’ private data, information being transferred unencrypted, or bugs that result in access to protected app components. We’ll award $1,000 for these bugs. For more information visit the Google Play Security Reward Program site. And finally, we want to give a shout out to the researchers who’ve submitted fuzzers to the Chrome Fuzzer Program: they get rewards for every eligible bug their fuzzers find without having to do any more work, or even filing a bug. Given how well things have been going these past years, we look forward to our Vulnerability Rewards Programs resulting in even more user protection in 2018 thanks to the hard work of the security research community. * Andrew Whalley (Chrome VRP), Mayank Jain (Android Security Rewards), and Renu Chaudhary (Google Play VRP) contributed mightily to help lead these Google-wide efforts.